Economic cooperation between Ghana and Germany is deepening by the day, with the number of German companies directly operating in the country growing significantly to 155, from below 100, a couple of years ago. 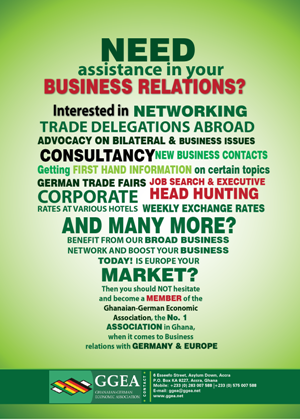 In recent times, German trade associations and institutions have organised a number of trade exhibitions with the Federal government also backing trade missions to Ghana, with reciprocal missions to Germany. These are helping to deepen trade and economic relations between the two countries. According to the Minister of Trade and Industry, Dr Ekwow Spio-Garbrah, Ghana is happy about the growing number of German companies which are dotted across the country playing in various sectors of the economy. “Credit must be given here to the impetuous work carried out by the Ghanaian-German Economic Association (GGEA), my own Ministry as well as other major stakeholders whose efforts culminated in the realisation of the aforementioned feat,” Dr Spio-Garbrah stated. He was speaking at the annual dinner dance of the GGEA, which was normally held to climax their activities for the year and provide policy and business perspectives into the beckoning year. 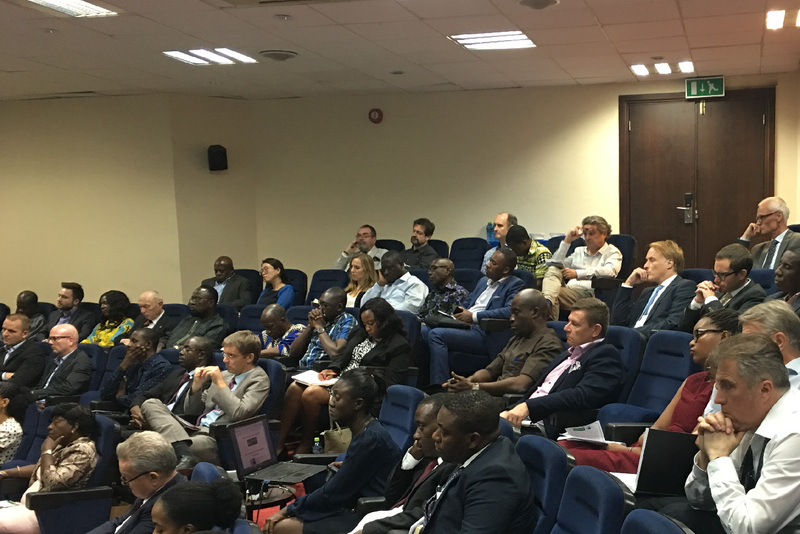 The Hysen-, Kasapreko Company Ltd- and Brussels Airlines-sponsored event was attended by members of the GGEA, a community of German and European businesses with interest in West Africa and Ghanaian companies with European interests. Silver Star Auto Ltd was honoured as the GGEA ‘company of the year’ for the various supports the company offered the GGEA and some of its members. While lauding the number of German businesses in the country, the trade minister called on them to increase their value of investments by forming joint ventures to increase capital injection. “The current level of technology transfer between Germany and Ghana is also low. Ghana could benefit from German investment in Ghanaian industries facing technological and resource constraints. Increased German investments in Ghana’s manufacturing could boost employment, diversify exports and improve firms’ efficiency with accelerated technology transfer,” Dr Spio-Garbrah stated. Germany has also been a key pillar of support in Ghana’s development efforts with programme and budget support, soaring after every three years. Between 2012 and 2014, Germany’s bilateral commitments to Ghana came to about €160 million in areas of agriculture, local government and decentralisation, economic development and renewable energy. Dr Spio-Garbrah further assured the business community that the government was aggressively building the necessary infrastructure to support the private sector, promote entrepreneurship and attract foreign direct investments. For his part, the German Ambassador to Ghana, Mr Ruediger John, said Germany would continue to provide developmental support to Ghana, adding that the bilateral relations between both countries had improved in recent months, heralded by President John Mahama’s visit to Germany on two occasions and reciprocal trade and diplomatic delegations from Germany. “All the visits centred on various forms of development assistance and Germany will soon commit more funds for the development of the agriculture, governance and other economic sectors,” stressing that his country would continue to provide budget support for the country. Last month, the German Ambassador announced fresh funds of €34 million for the medium term, spanning 2015-2017. The President of the GGEA, Mr Stephen Antwi, called on the government to ensure that the energy crisis became a thing of the past in 2016 because it was severely affecting its members and the business community in general. “The energy situation has affected our members severely as well as other businesses in 2015. We know the government has brought in some generating assets, but our concern is whether there is any strategic policy in place to ensure constant supply of the necessary fuels to fire the engines. As businesses, we don’t want to see any ‘dumsor’ or any power issues in 2016,” Mr Antwi stated.